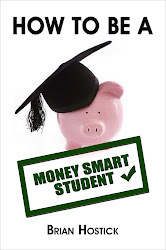 A lot of my information here at Money Smart Students deals with how to try and borrow as little money as possible to complete your post-secondary education. The following story in USA Today proves that taking out student loans has the potential to be disastrous to your future credit rating and to your ability to financially handle the major events after college - buying a car, or a home, or even getting married. The story has some scary facts about the rate of default for loans throughout the United States. It also appears that you have a greater possibility of defaulting on your student loans if you attend a for-profit college. Give the article a read through and keep it in mind the next time you go to apply for a student loan. I'd like to touch on something in this post which isn't a tip, or a reminder, it's just the reason I, and most other personal finance bloggers, do this thing we do. When I give talks at high schools, I throw out facts and figures, give some examples of money saving ideas, and do a fun exercise at the end about retirement. But the main focus of my presentation is to simply try and get the students to think about their personal finances. One 30 minute speech can't teach you everything about handling your money. A few laughs and some interesting anecdotes won't pay your way through college. But if I can succeed, through my presentations, this blog, Twitter and Facebook to make you more aware of how easy, and important, it is for you to be connected to your money - then my work here has a purpose. There are lots of resources online, and off, which students can use to budget, track and save their money. I don't presume to know all of them. I know I don't. But bringing a few good ones to your attention and then having you 'take the ball and run' means I am doing my job as a provider of information. The entire saying I started in the title is this - 'If it is to be - it is up to me!' I remember that from my childhood and I try to put it into practice as much as possible. It's the same way with being a Money Smart Student. You are the only one who can decide if you want to stay on top of your finances - or if you are going to be like most people and let your finances control you rather than the other way around.Cheers! The Push is on For Scholarship Money! I just caught the last couple of minutes of a great Twitter chat dealing with the subject of Scholarships and college finances. I'm going to be connecting with many of the people who took part in that chat and hope to be able to grab a lot of information and resources which I can pass along. Meanwhile - here's a few points mentioned by the participants. First, and foremost, highschool seniors should be very involved in the scholarship process right now and moving forward towards the end of the year. Most awards have deadlines early in the new year (if not before) and missing the deadline gives you a 100% chance of NOT getting a scholarship. From Mark Kantrowitz @mkant (the man behind Fastweb.com - which is on our link list to the right) - Make sure you pay close attention to the instructions given with each particular application. Different scholarships have different rules and if you forget a required attachment or some other piece of information, you'll be out of luck. Also make sure you fill out the applications completely. Don't leave any blank spots and get somebody else to proofread your application for errors, omissions and spelling mistakes. Do your homework on the scholarships and bursaries which are out there. There's over 150 scholarships available just for students who were members of their school's FIRST Robotics team! There are all kinds of 'specialty' scholarships like that available. You just need to do the legwork (or Google work) to find them. Also, don't write off the small ones. Even the smallest dollar amount means less money you (or your parents) will have to borrow. Think about it - 5 to 10 $100 bursaries add up to between $500 and $1,000. Send in all the applications you can - you never know what you might get. A great final tip from @CollegeCashChat - clean up the email address you are going to use on your applications. Firstname.lastname(at)gmail.com looks a lot better than sexykitten(at)hotmail. This is the time to really put the push on when it comes to scholarships. Good Luck! My thanks to the people mentioned in this post and the others on Twitter for some great info and even better connections. Looking forward to joining the discussion next week. Cheers! People Are Catching On! You Really Should Get That Degree! Parents are also realizing that in order to pay for their child's college education - there are sacrifices and changes which have to take place. Many parents are getting second jobs. The biggest area being focussed on is money saving techniques. Reducing costs and expenditures while at college is the best way to make that 3 or 4 year stay more affordable. These are all practices we've been talking about for ages on this blog and elsewhere. Check out the article for some interesting information about college costs and how people are affording the ever-increasing pricetag of a higher education. On a totally different note - Money Smart Students is happy to report that we are now listed in the Wisebread.com list of personal finance blogs. We're waaaaay down there in the rankings because of our young age and limited content to this point - but that's about to change. In the days, weeks and months ahead, Money Smart Students will be posting lots of quality information and working hard to get more readers, Twitter followers, amd facebook Likes. We welcome your comments and input on how we can make ourselves better and spread the word about the importance of being Money Smart Students and ready for the real world!